Who is most likely to attend your destination or event: city dwellers, suburbanites or rural residents? City dwellers attend more attractions, more often. People living in the city will attend on average 13 unique attractions per year (any entertainment destination including events, museums & galleries, theatre & performing arts, sports, etc.). Meanwhile, people living in suburbs attend 6 attractions, and those living in rural areas attend an average of 4 attractions per year. Diversity of attractions: City residents attend a much wider range of attractions than those who live in suburban and rural areas, including both mainstream activities (basketball and baseball, and larger performing arts organizations and museums) as well as more eclectic destinations (independent theatre and performing arts, festivals, cultural events, etc.). The more eclectic the activity, the less likely it is to draw audiences from outside the city core. Those living outside the city are most likely to attend family-oriented activities and sports. In fact, many family-oriented activities are much more likely to draw a suburban or rural audience than city residents. Is there an opportunity to change this trend? If you are an independent theatre or a performing arts organization, how can you compel suburbanites to attend? If you are a tourist-oriented destination how can you increase your audience share of city dwellers? Our research shows that your advertising media mix can influence your success. 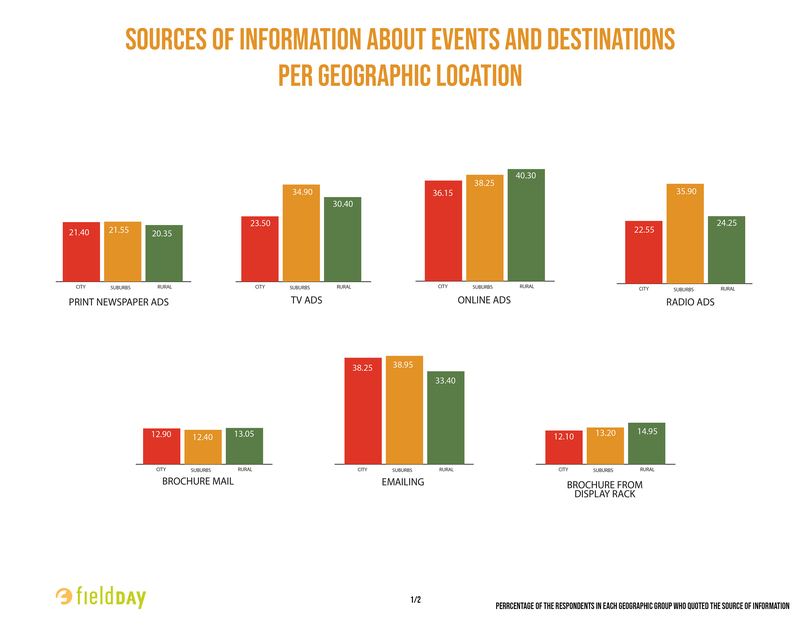 As part of our study, we looked at the media sources that people rely on for information about events and destinations, and we saw that there are differences based on geographic location. TV and radio are losing relevance with city dwellers. TV and radio advertising are not very efficient if you want to attract people living in the city (only 23.5% of people living in the city quoted TV as source of information, and 22% quoted radio). However, TV and radio are still a good options to reach suburbanites (34.90% rely of television, 35.9% mentioned radio as a source of information). Instagram is on the rise. Instagram is increasingly a popular source of information for people living in the city (24.6% and rising). 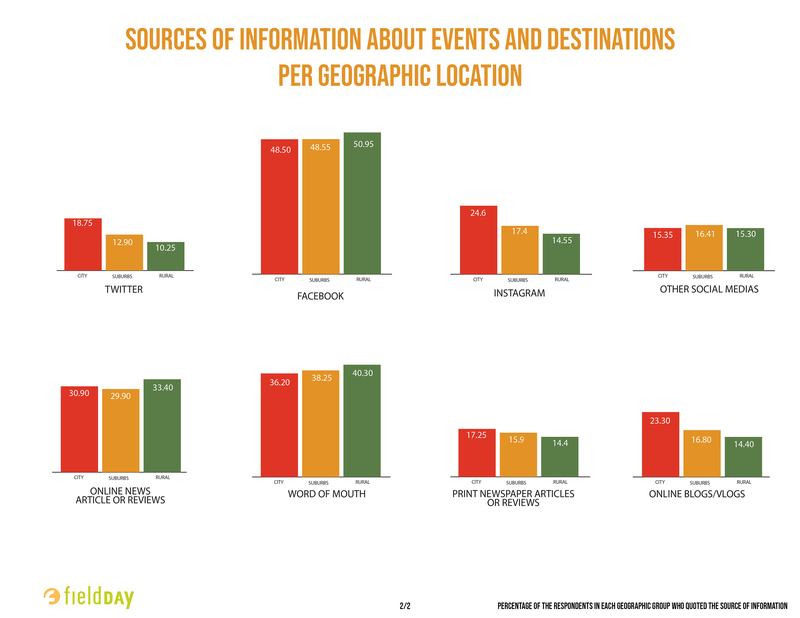 While it is also increasingly popular among suburbanites and rural people, only 17.4% of suburbanites and 14.55% of rural dwellers quoted Instagram as source of information about events and destinations. Our needs and biases clearly change depending on our geographic location. Understanding the how attendance patterns and media usage change by geographic location can help you to shape an effective and efficient marketing strategy. With over 30 years delivering advertising strategies for major destination and event brands, Field can help you to drive audience growth.